Trump’s historic unpopularity is the defining characteristic of his presidency. Donald Trump’s historic unpopularity will define his presidency. Photo illustration by Slate. Images by Chip Somodevilla/Getty Images; Gearstd/iStock. To look back at Donald Trump’s first year in office is to see steady assaults on truth, on propriety, and on the rule of law. Looking forward, we can expect more of the same. Already, on the second day of the year, President Trump has asked the Justice Department to investigate a political opponent, a textbook example of authoritarian behavior. But in chronicling the continued chaos of the administration, we shouldn’t neglect the through-line of Trump’s presidency, his unprecedented unpopularity. Partisan rancor, stark ideological divides, and a media preoccupation with the president’s most fervent supporters has obscured the key reality of the political moment: Most Americans dislike the president and a sizable, intense minority want to restrain his administration by any means possible. 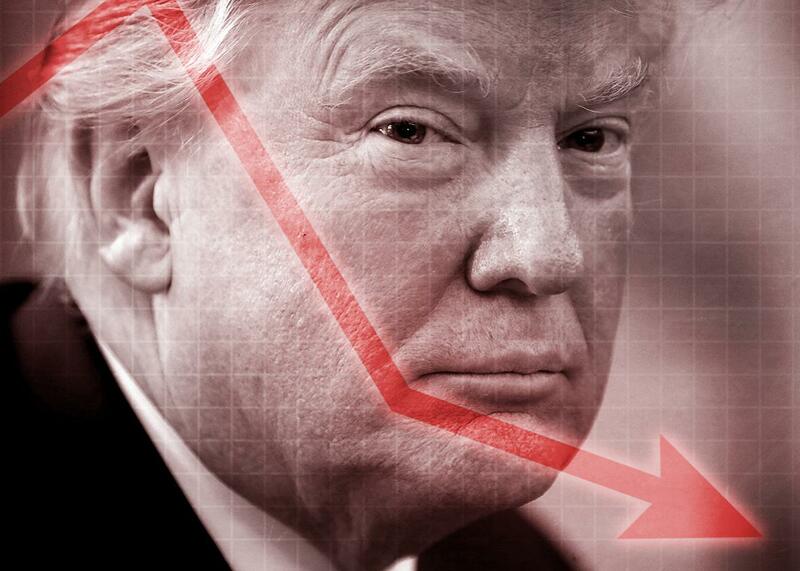 Despite a roaring economy, Donald Trump is the most unpopular first-year president in the history of modern polling. His average job approval—as measured by FiveThirtyEight—stands at 38 percent and his disapproval hovers at 56 percent. Trump claims that he is as popular as Barack Obama was at this point in his presidency, but the record tells a different story. At the start of 2010, an average 46 percent of Americans approved of Obama’s job performance, to 49 percent who disapproved. And while impeachment has yet to enter the larger political conversation, the constituency for removing him from office is larger than the one that backs his tenure. It is tempting to treat Trump’s unpopularity as old news, given how little it has changed over the past year, and the constant twists and turns of the administration. Indeed, end-of-year coverage has given short shrift to the president’s standing, turning instead to the spectacle of his core supporters and their staunch allegiance, or focusing on the ways Trump has upended the presidency and its traditional expectations for behavior and decorum. But if we’re trying to evaluate Trump and his prospects with any accuracy or understanding, then his popularity—or lack thereof—must take center stage. The president’s low standing has exerted a downward pull on the rest of the Republican Party and its legislative agenda. Wide distrust and disdain for Trump, for example, contributed to even wider disdain and mistrust for the tax cuts shepherded by congressional Republicans and sold by his White House. It was the major factor driving the Democratic wave that swept Virginia’s state elections, and it helped level the field in Alabama, where Democrat Doug Jones held a competitive position against Republican Roy Moore before revelations that Moore pursued sexual relationships with teenage girls as a man in his 30s. Trump’s deep unpopularity spurred grass-roots challenges that stymied the attempted “Muslim ban” and stopped the months-long effort to repeal the Affordable Care Act. It has repeatedly restrained his freedom of movement as a political actor—he has little capital to burn. And to the extent that many Republican lawmakers have yet to fully yoke themselves to Trump, it is because his unpopularity is a clear danger to their political prospects. Implicit in coverage of Trump is the idea that he’s upended the rules of American politics, succeeding with strategies that would have failed (or disgraced) previous officeholders—that he’s another “Teflon president,” impervious to political opponents. But this doesn’t fit the reality of the situation. Donald Trump was an unpopular figure who won the White House by the skin of his teeth, becoming president despite losing the majority of voters by winning just enough votes in the right places. And in the first year of his presidency, he’s done almost nothing to persuade skeptical Americans that he is worthy of their support. He’s committed himself to divisive rhetoric and action, and seems oblivious to the massive backlash against his administration as a result. Yes, his most fervent supporters are prepared to back him to the end. But that’s been true for most presidents. Even Richard Nixon, widely maligned in the annals of presidential history, had a stable core of support on the eve of his resignation. Donald Trump’s strong grip on his base belies his astounding weakness with most segments of the public. In Iowa, for example, 57 percent of voters disapprove of his job performance in a state that backed him by a 9 percentage point margin over Hillary Clinton. After a shocking presidential election in 2016, we saw in 2017, that political gravity was still real, and that far from upending the game, President Trump has been constrained by it, limping through his first year with little to show but the lowest hanging fruit in the orchard of conservative policy. Now, in 2018, the major question isn’t will Trump fall but how low can he go and what will he take down with him?